Reglo AS manufactures pneumatic train access platforms including the the pneumatically operated WALL-MAN ® and LIFTMAN TM for markets worldwide. Reglo AS has an established network of trusted partners operating in Europe, North-America, South-America, Asia and Australia. Reglo AS supply railway maintenance and painting shops worldwide with working platform and lifts, to be used in the maintenance of trains, preparation before painting of trains (ie sanding, masking, smaller repair jobs) and painting of trains. The man lifts run on compressed air and can be used in flammable environments, where fumes and gases are present. 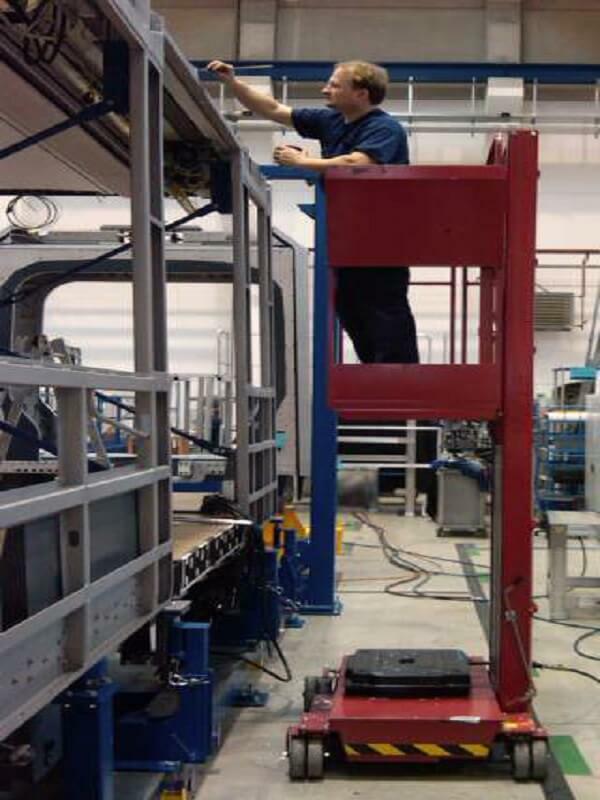 All platforms and lifts are made in accordance with regulating standards and norms for personnel lifting (CE, UL, ATEX). From the benefits derived from projects done for the larger commercial vehicles segment, both WALL-MAN ® and LIFTMAN TM have been adopted to the railway segment. The WALL-MAN ® and LIFTMAN TM are pneumatically powered platforms, which are now well-accepted as standard practice for accessing carriages and wagons at height for preparation and painting. By utilizing air (compressed air) for movement in all axis, which is almost always accessible in all maintenance and painting shops – the pneumatic train access platforms and lifts, WALL-MAN ® and LIFTMAN TM are able to operate in environments where flammable fumes and gases are present (ATEX-environments). The pneumatic lifts and platforms are all CE, UL and ATEX certified. WALL-MAN ® and LIFTMAN TM have enjoyed a worldwide distribution due to their principle of easy instalment, easy to use, easy to maintain, quality and durability. The products have been sold and installed in over 40 countries, covering Europe, North-America, South-America, Asia and Australia. The WALL-MAN ® can be customized to the requirements and tasks of the customer, which includes desired height (up/down), travel-length (right/left) and movement from the wall towards the object (train), and various types of accessories for the operator/worker. Compressed air is the power behind the WALL-MAN ® (pneumatically operated). The WALL-MAN ® allows the operator easy access of carriages and wagons at height for both maintenance, preparation and painting. The platform can carry up to 150 kg / 330.7 lb, and can lift up to 4,5 meters / 14.76 feet above the ground level. The lifting height can also be reduced to fit smaller working areas. As trains comes in various shapes and sizes, we have added a new WALL-MAN ® to the portfolio. The WALL-MAN ® XL is designed to carry more, go higher, and is still powered by compressed air / pneumatically operated. It has the same attributes and benefits as the standard WALL-MAN ®. The platform can carry up to 250 kg / 551.2 lb, with a wider cage for 2 operators, lifting the operator up to 6 meters / 19.69 feet above the ground. The LIFTMAN TM is a free-standing and steerable platform, designed to be utilized in preparation areas and spray booths, where the operator can easily move from location to location, without having to return to floor level. The LIFTMAN TM pneumatic train access platforms are powered by compressed air / pneumatically operated, and has a working radius of 10 meters / approx. 33 feet. The working height at shoulder is approx. 4.5 meters / approx. 15 feet. The LIFTMAN TM does not need any type of installation at site, only access to compressed air. Reglo AS has for more than three decades supported the railway sector with its solutions and products, solving key issues reflecting working-at-height procedures – safely and efficiently, with less operator strain, a quicker job turnaround and better paint finish. The experience and the feedback from our customers and partners, have driven the innovation within the Reglo-portfolio of man lifts. WALL-MAN ® and LIFTMAN TM are both valued by customers and recognized as one of the leading brands within pneumatically powered working platforms and lifts. Over the years Reglo AS has had been the preferred manufacture to deliver to many high profiled and leading end customer through our well-working partners worldwide.